The Aquaglide Aquaparks are heaps of fun for the whole family! With Aquaglides quality products and affordable prices you won't be disappointed. Aquaglides interlocking features make it easy to add different inflatables to allow your Aquapark to be as big or as small as you like. Purchase one of the 3 bouncers alone or add a slide and I-Log. 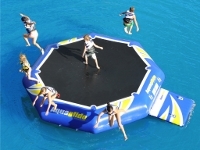 You could also add one of Aquaglides various platforms or loungers. Weight 71 lbs. 94 lbs. 125 lbs. Tube Material Commercial grade Duratex™ fabric reinforced PVC material. Ideally suited for watersports, Duratex™ material is the finest, commercial grade fabric reinforced PVC available. Each Aquaglide Platinum item is treated with UV Block™, the highest grade 3-year UV coating available. Radio Frequency Welding is the process used to fuse DuraTex™ material seams for years of trouble-free use. RF welding produces clean, strong seams with no unsightly glue marks or splits. (L x W x H) 24.5" x 16.5" x 20.5"
81 lbs. 40" x 12" x 27" 114 lbs. 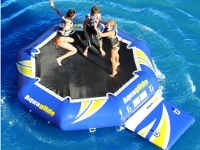 Aquaglide Bouncers have it all! Add a Blast Bag to your Aquapark! 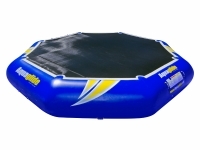 Blast friends, relatives and kids (carefully) into the air for big-time thrills, and splashes! Blast Bag easily attaches to your Aquaglide bouncer.